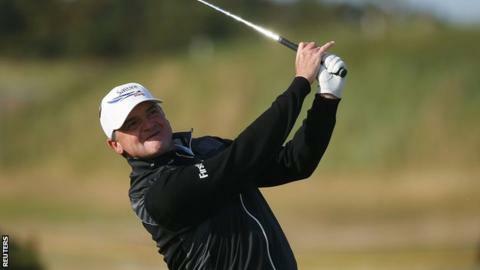 Scotland's Paul Lawrie is two shots off the lead at the halfway stage of a weather-disrupted Open at St Andrews. The former Open champion followed an opening round of 66 with a 70 to sit on eight under par, within touching distance of leader Dustin Johnson. Fellow Scot Marc Warren is a shot further back on seven under par after carding a 69. The Open will finish on a Monday for only the second time in its history after high winds battered the course. With 40mph gusts of wind, play was suspended at 07:32 BST on Saturday and resumed at 18:00. Governing body the R&A tweeted: "The intention is to complete the second round today with R3 to be played on Sunday and the final round on Monday." Lawrie, who has only England's Danny Willett and America's Dustin Johnson ahead of him, declared himself happy with his second-round display as "pretty solid". "I struggled a wee bit when I went back out and had to hole a couple of decent putts for pars," he said. "I should've birdied 18 really and hit a poor chip. But, apart from that, I played solid and 70 was about right." Richie Ramsay was the only other Scot to make the cut, his second-round 71 ensuring he stayed for the final two rounds by a stroke. A second successive 73 meant that Stephen Gallacher missed out by two strokes, while Russell Knox also finished at two-over par after a 74. Veteran Sandy Lyle was a further stroke back after a 76.